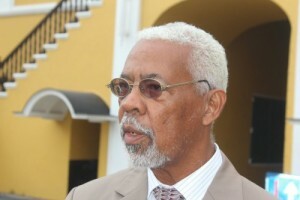 WILLEMSTAD – In a letter to the new Minister of Economic Development Errol Goeloe, the interim management of the local aviation company InselAir indicated that it had learned that a delegation of the government of Curaçao had a meeting with representatives of Synergy Aerospace Corporation in Florida last weekend. “According to the press, the delegation has kept the course as it was agreed upon in the recently signed letter of intent and maintained the spirit of the draft of the Heads of Agreement. Apparently, nothing was taken off the table. If there are any written job guarantees obtained, management would welcome a copy thereof. If nothing in writing exists, any specifics of verbal information would be much appreciated,” said the interim management in their letter. Apparently, the government did not follow the suggestion of the majority in a recently held central committee meeting on lnselAir in parliament. In this meeting, the majority suggested that financial support to Inselair should be discontinued. The management stressed that discontinuation of financing that is effectively operational budget, poses a risk to InselAir’s continued operations, not to mention a modest growth, and increases the risk of further lay-offs. Current employee levels are based on a modest growth scenario. According to the company, a modest growth contributes to the airline’s value in the short term, and will, therefore, improve the creditors’ prospects for recovery of their claims, even though most creditors should be aware that they will likely remain with a considerable unrecoverable portion of their claims. Finally, the management suggested that the government refrains from any conversations or negotiations with strategic partners, without InselAir’s management’s, supervisory board’s and trustee’s involvement. The management’s and the supervisory board’s involvement are provided for in the loan agreement dated 27 January 2017 and, moreover, the creditors, including (ex-)employees, will need to be satisfied that any agreement negotiated would be in their best interests. The trustee, working with management support, is appointed by the court in order to safeguard those interests. The management also indicated that they have been informed by Synergy Aerospace, that, in order to avoid unwanted misunderstandings or inaccuracies, it will not entertain further conversations outside the presence of the trustee. The letter was signed by the interim manager G. Filiatreault and the trustee R. Van den Heuvel.